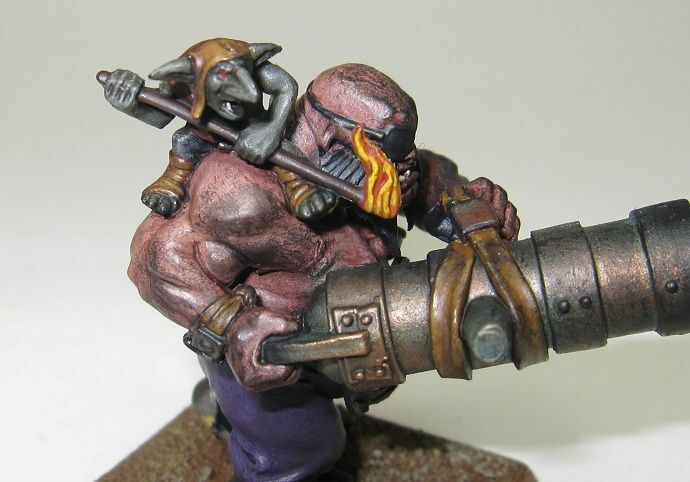 My 40k Fight Club 2011 Painting Challenge projects for this month are an Ogre Kingdoms Slaughtermaster and Firebelly. I am trying to get an early start on them this month instead of waiting until the last minute like I did last month. I have no idea at this time how I am going to paint all the meat hanging off the Slaughtermaster, I have never painted raw meat before. Anyone have any suggestions or tips? 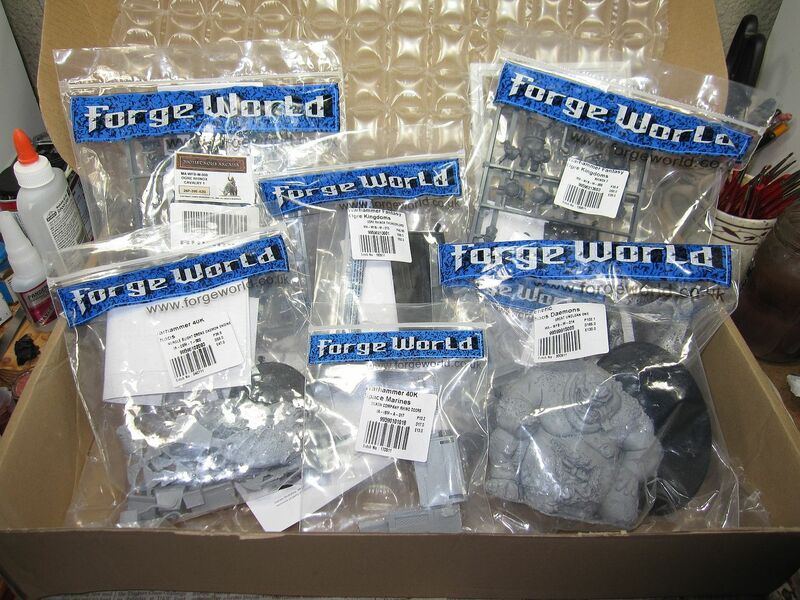 A couple of weeks ago I order the new Battlefoam Ogre Kingdoms trays for my Ogre army and they just arrived today. I really wanted to get these because I was nervous about transporting my Stonehorn and Thundertusk. 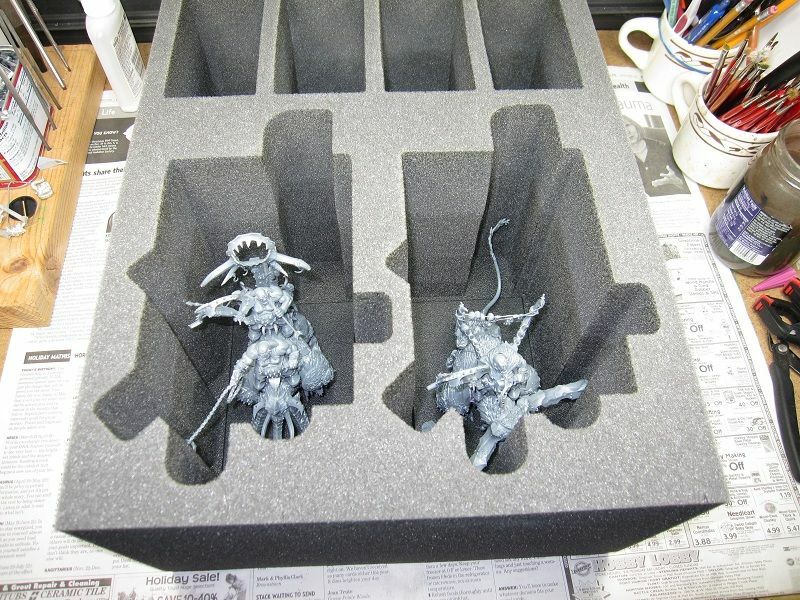 Here are the trays of that I ordered. 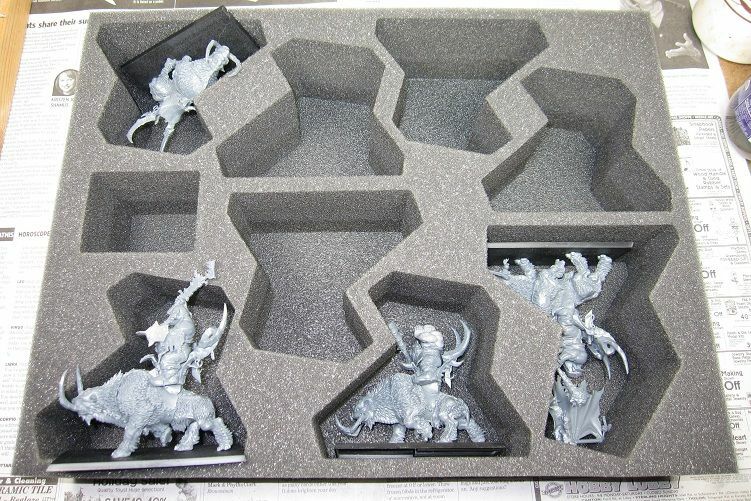 This is the new Ogre Troop Tray. 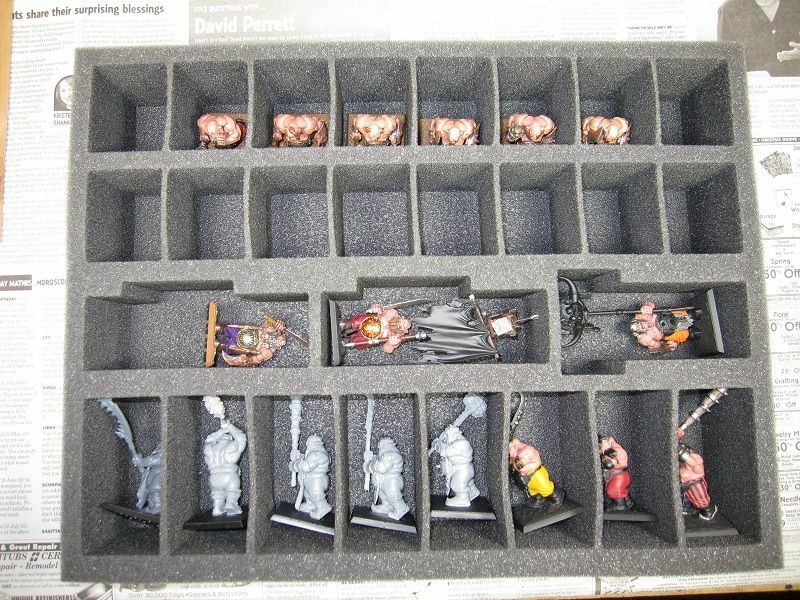 It holds 16 Ogres, 8 Ironguts, and three Standard Bearers. The only issue with this tray is that the Crusher's sword sticks out of the top of the tray. Otherwise everything fits nicely. 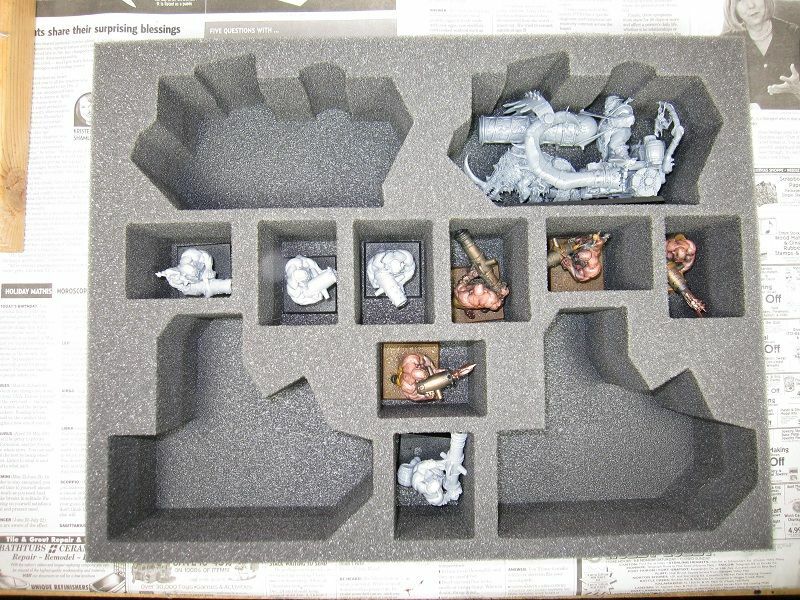 Next is the Ogre Artillery tray. It holds 8 Leadbelchers, 2 Ironblasters, and 2 Scraplaunchers. I have not built my new Scraplauncher yet, but everything else fits nicely. Here is the Lord and Hero tray. 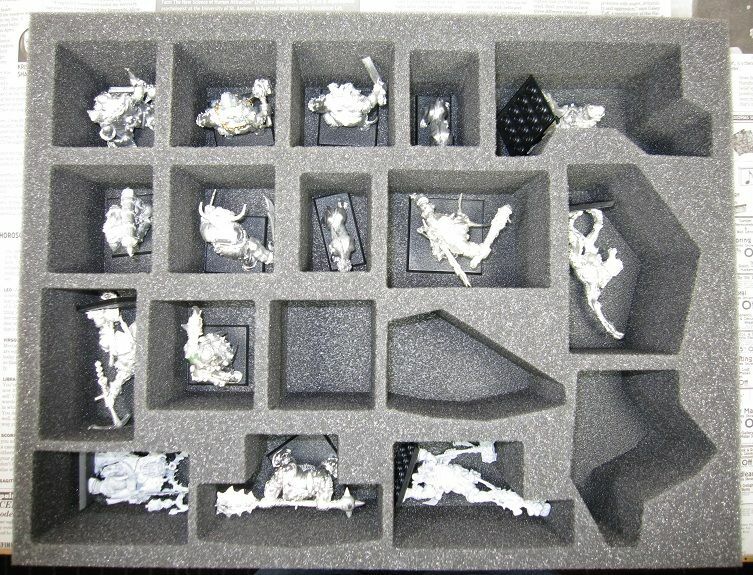 It holds all the special characters, casters, Hunter, Sabertusks, and lots of Maneaters. Since I do not have the two large special characters, I am using those slots for my Gorgers. 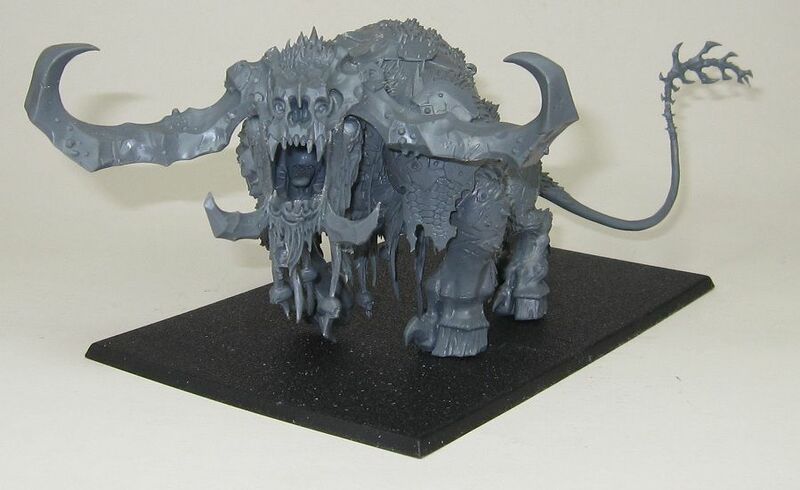 The Thundertusk/Stonehorn tray holds two of these plus four Mournfang Cavalry. This is the thickest tray I have seen coming in at 7 inches. 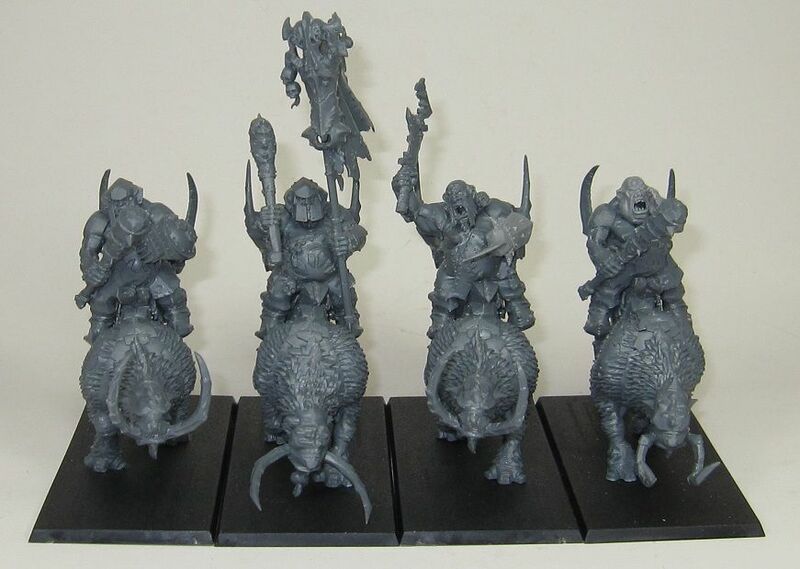 I am using the Mournfang slots to hold my Rhinox Riders. 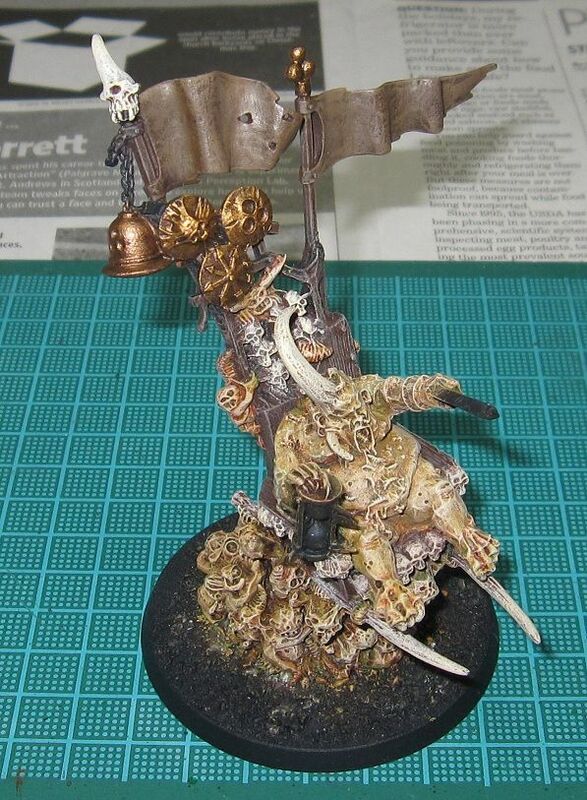 Lastly is the Mournfang tray which holds eight models, including a standard bearer. 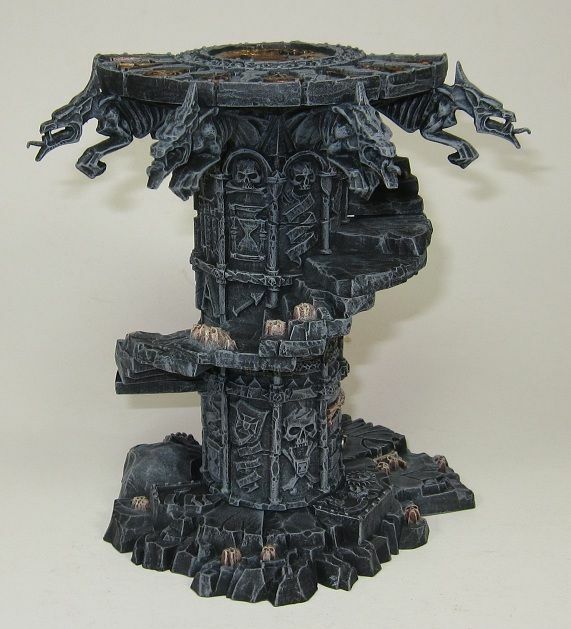 Unfortunately, some of the Mournfang do not fit in these slots. 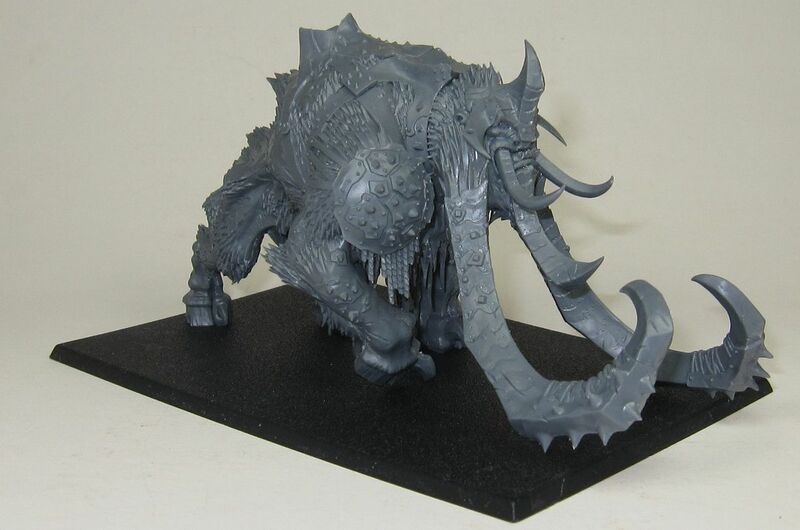 The mounts that have upward pointing tusks will not fit in any of the slots. Also, the raised sword on the crusher will not fit either. Otherwise everything else fits nicely. Overall I am very happy with these trays. I just wish the mournfang would fit. I am sure I can cut some slots to make them fit, but I just hate cutting these up. I was able to knock out my September painting projects in just over a day. They were really easy to paint. 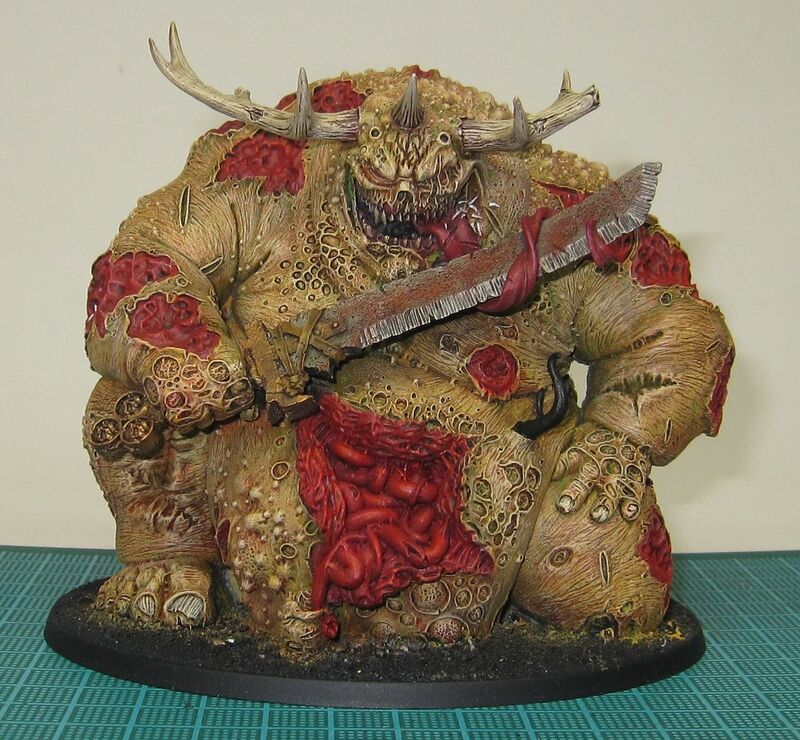 I have made some progress on my Slaughtermaster this week, I added a few hunks of meat that were included with the new new Stonehorn/Thundertusk and Mournfang kits. I like the way it came out so far, but I am not sure if I am done with him yet. What do you think? 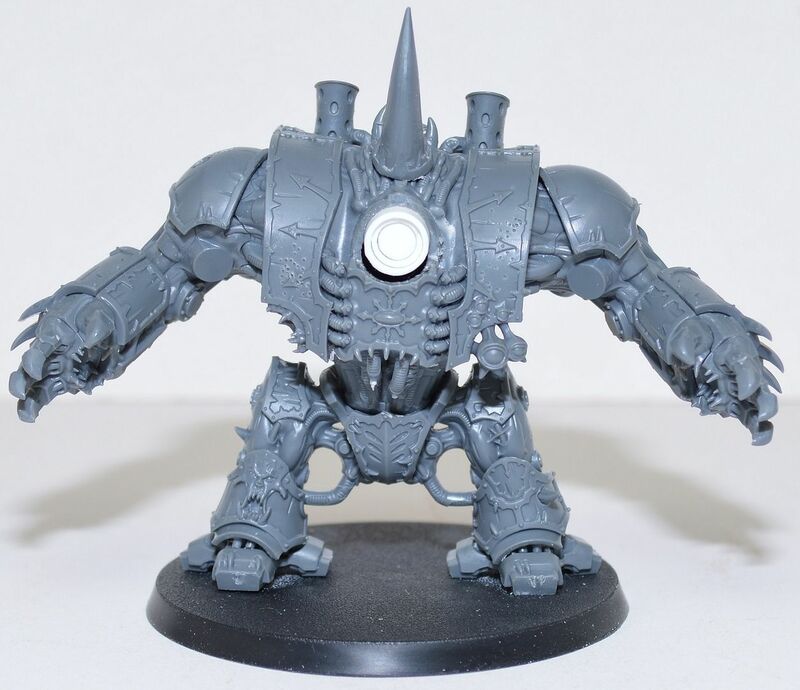 I also have kitbashed a new Irongut Gutlord using some of the pieces from various different kits. The head is from the Ironblaster/Scraplauncher kit and was really the inspiration for this model. 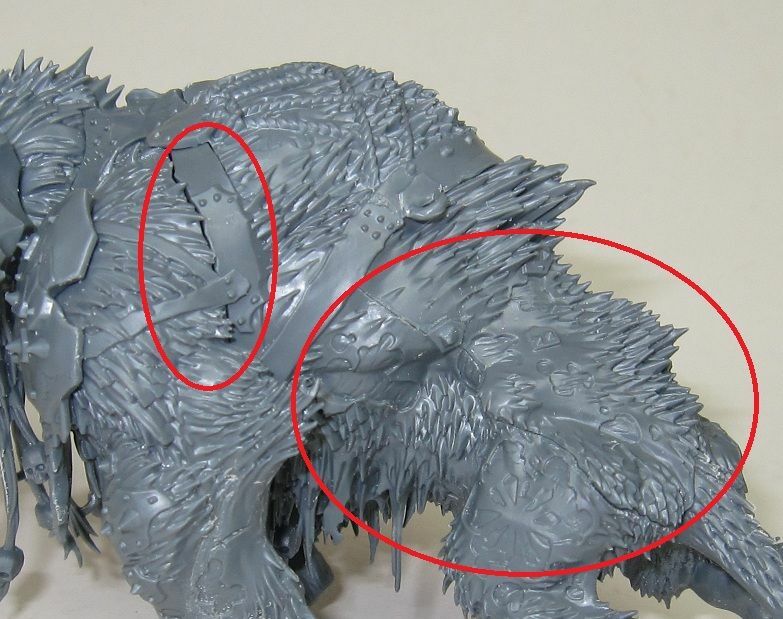 The greatweapon is from the Mournfang kit. This was on Tuesday night and it was really just a practice game. A friend of mine from my FLGS is starting to get back into Fantasy with his Wood Elves and this was our third game with both of us trying to learn the 8th edition rules. It was 1500 points and it was a decisive victory for the Wood Elves. I mainly just wanted to try some of the new stuff out and here are my impressions. Using Grut's Sickle helped me to easily cast my spells and not have them countered, that is until turn two when I rolled the snake-eyes at the end of the Magic Phase and I lost my only caster. That was costly. The Mournfang Cavalry charged a unit of Tree-kin on round two. Unfortunately, they did poorly during combat. They managed to kill one Tree-kin but lost one Mournfang. The Mournfang lost combat by one, they fled and were run down. The Ogre unit failed a charge against a large unit of Dryads, who charged in the subsequent turn. It was a pretty even match up as the first two turns of combat were tied but went to the Ogres thanks to the Bellower. The Dryads failed their second Ld check and fled. They were run down. I lost my unit of Leadbelchers to the scouting Waywatchers with Killing Blow over the first two turns, and then two of the Ironguts on turn three. Waywatchers are vicious against Ogres. The Stonehorn was my only survivor of the game, it still had two wounds left. It did manage to kill a full unit of Gladeguard and the two remaining Tree-kin. Mine have at least. I picked up the new Ogre Kingdoms army book last night and I have pretty much already read through it. I like it. I am no expert when it comes to WHFB, but the book seems balanced. Most of the rumors I read were true. Here are some of the things that have changed. 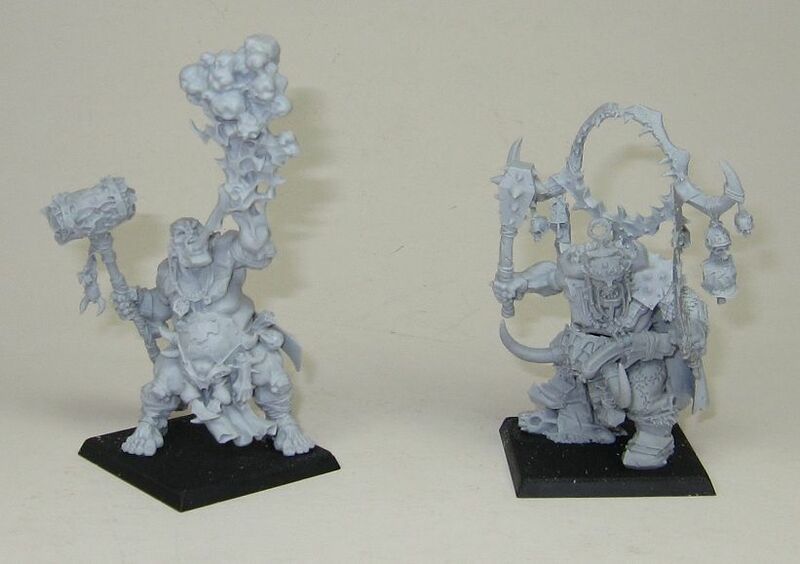 Slaughtermasters can now be the army General. I like this a lot. Maneaters are cheaper and are now a Special choice instead of Rare. They now have a rule called Been There, Done That that allows them to choose two special rules from the following list: Immune to Psychology, Poisoned Attacks, Scout, Sniper, Strider, Stubborn, Swiftstride and Vanguard. No two Maneater units are allowed to take the same rule. A lot of possibilities here. 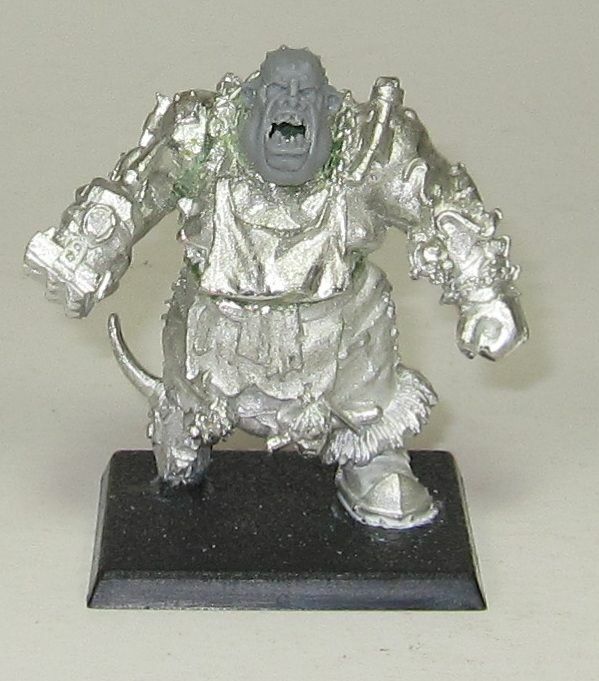 Ogres (sadly they are no longer called Bulls) are now 5 points cheaper and include Light Armor. Ironfists are cheaper, but now only count as shields. 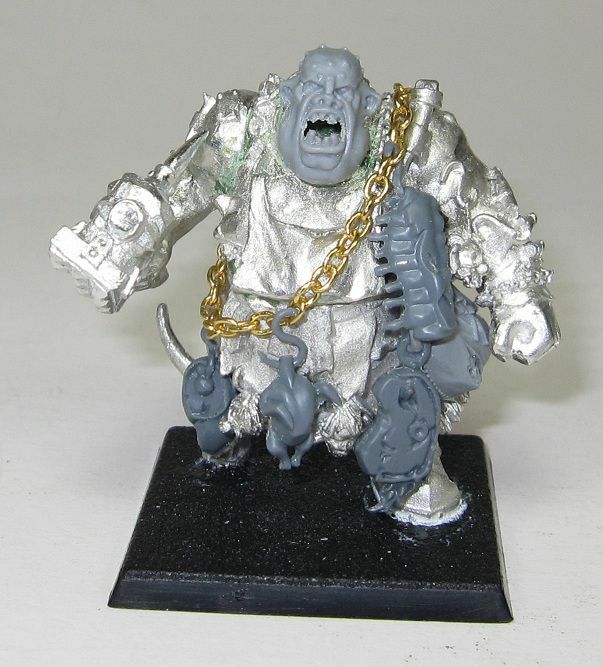 Ironguts also dropped in points. Command group upgrade costs are cheaper and are pretty standard throughout the book. Leadbelchers have changed significantly. In addition to being cheaper, they now roll a d6 for the number of shots instead of the misfire dice (No more misfires!). 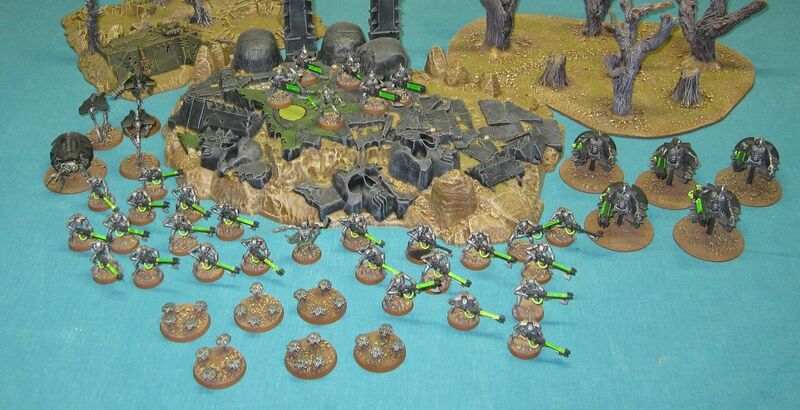 Plus they can fire every turn and the range of the Leadbelcher cannon increased to 24". They do not suffer shooting penalties for Moving and Shooting or Multiple Shots. However, they are now Slow to Fire and cannot Stand and Shoot as a charge reaction. Gnoblars went up half a point and lost Sharp Stuff. They now just have throwing weapons. Trappers are now a unit upgrade for Gnoblar units and they cause any unit that successfully charges the front rank of the unit to make a Dangerous Terrain test for the entire charging unit once the charge is complete! As far as I can tell, this is in addition to being able to Stand & Shoot with their throwing weapons! Units will think twice before charging them! The Scraplauncher moved to a Rare slot, and now uses the small blast template but it retains Killing Blow. We will probably see a lot less of these on the battle fields. All the new stuff looks great, but that will have to wait for another post. 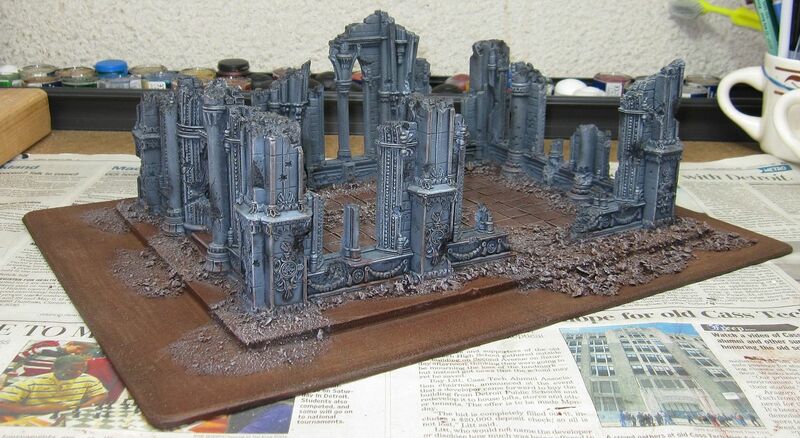 I cannot wait to get my Ogres onto the battlefield! 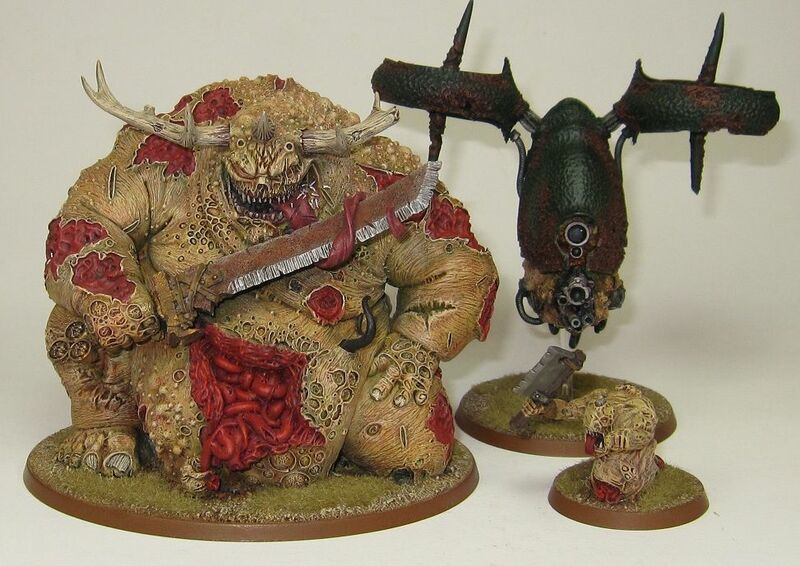 The Contagion is my WH40k Nurgle Chaos Daemon army and it is one of my favorite armies, both to model and to play. 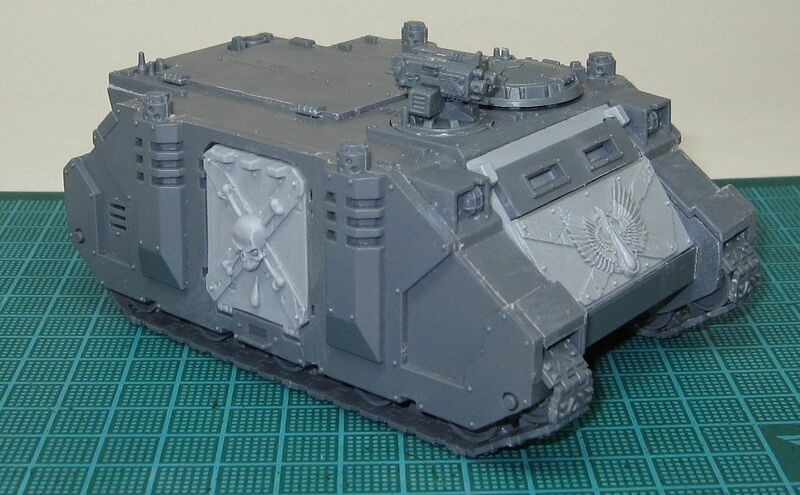 I have been working on this army on and off for two years now and with my recent Forge World purchase, I have finally gotten everything I wanted for it. I am very close to completing this army. I have just four models left to paint before it will be fully painted, making it my first fully painted army ever. 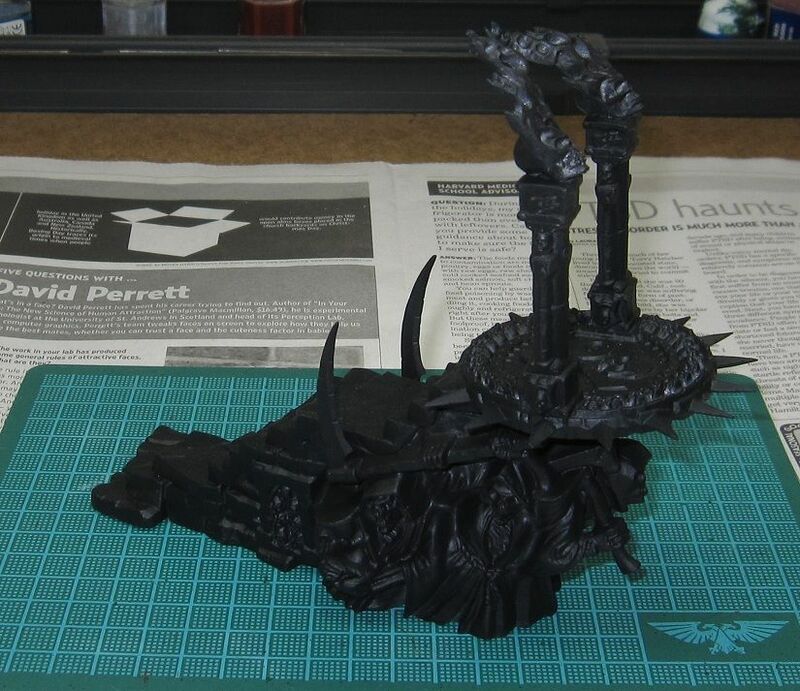 The models I have left to finish are Scabieathrax, a third Nurgle Blight Drone, Epidemius, and a Herald of Nurgle. I am going to make all of these my 40kFightClub.com 2011 Painting Challenge Projects for the month of August. 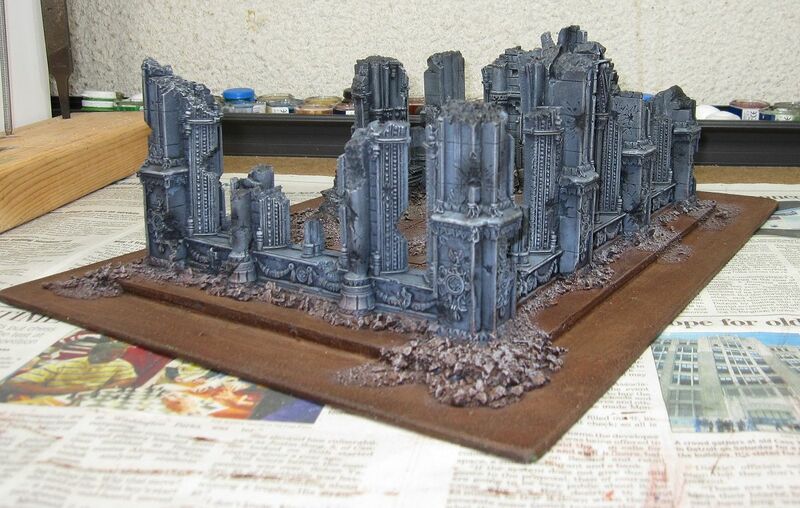 It is ambitious, but it will be worth it to finish an army for once. 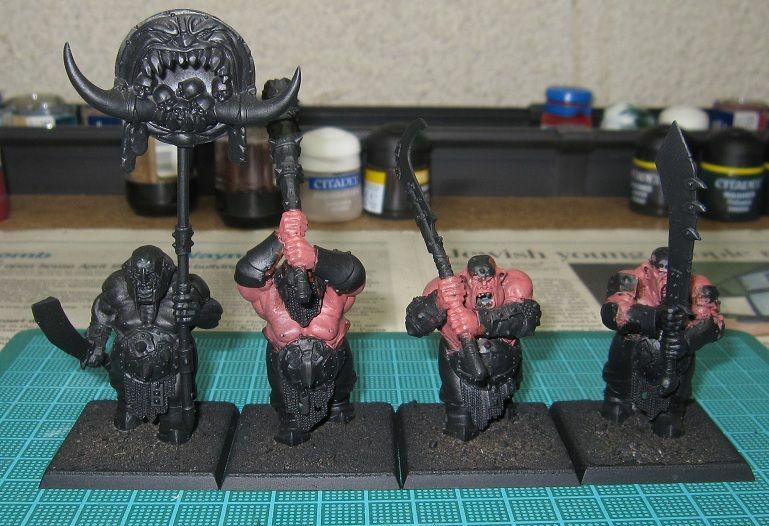 Once I finish this army, I can then concentrate on my Ogre Kingdoms army since the new book is coming out in September. Warmachine? 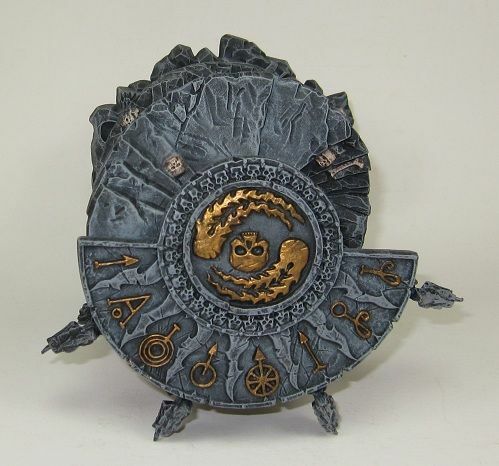 Malifaux? Infinity? Hell Dorado? How to choose one? I am a long time player of 40k and WHFB (on and off for twenty-three years now) and I have never tried any other miniature war game system. However, I have been feeling the urge for the past couple of months to try something new and I have been looking at other game systems like Warmachine, Malifaux, Hell Dorado, and Infinity. 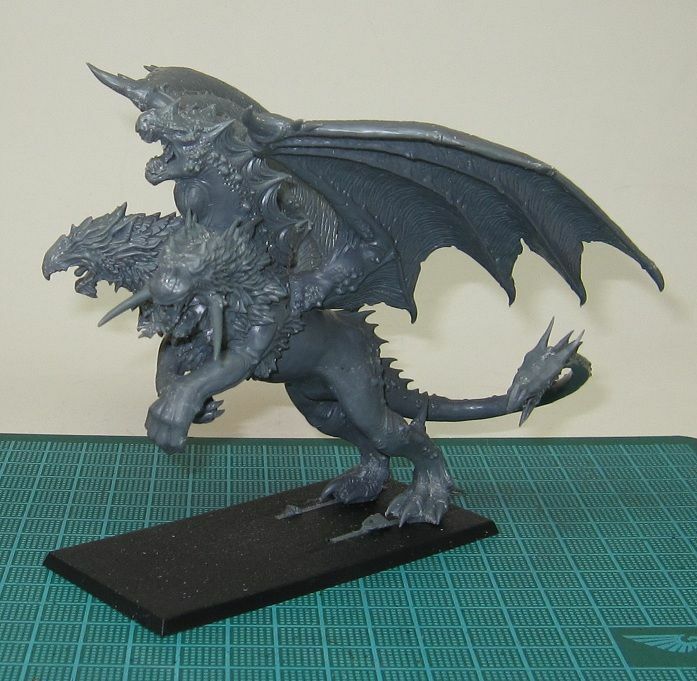 Do not get me wrong, by no means am I quitting 40k or WHFB, I simply want to try something different. There has been a lot of talk about Warmachine in the blogosphere over the past couple of months, mainly by people leaving GW. I have looked into the game to see what it is about and I like what I have seen. My FLGS carries a large amount of Warmachine stock, as well as Malifaux, Inifinity, and Hell Dorado, and they all have good looking minis. However, Warmachine seems to interest me the most, particularly Cryx or Khador. Anyone got any advice, or want to try to persuade me to/from any specific game system/army/faction? I have completed my 40kFightClub.com 2011 Painting Challenge project for this month, a unit of Ogre Kingdoms Leadbelchers. After I painted these Leadbelchers and washed them with Devlan Mud, I drybrushed the front of them with Chaos Black to make them look covered with soot. I like the effect, the soot makes their eyes and teeth really pop! 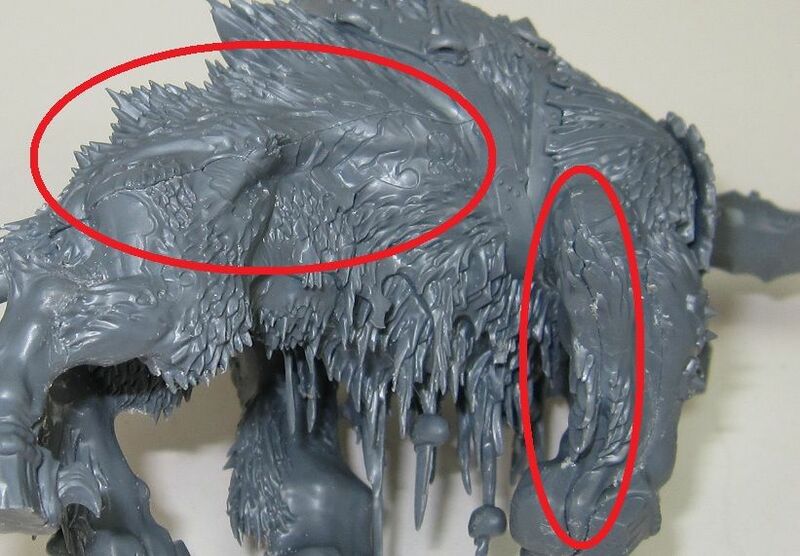 Here is a close up of the Gnoblar that sits on the shoulder of one of the Ogres. 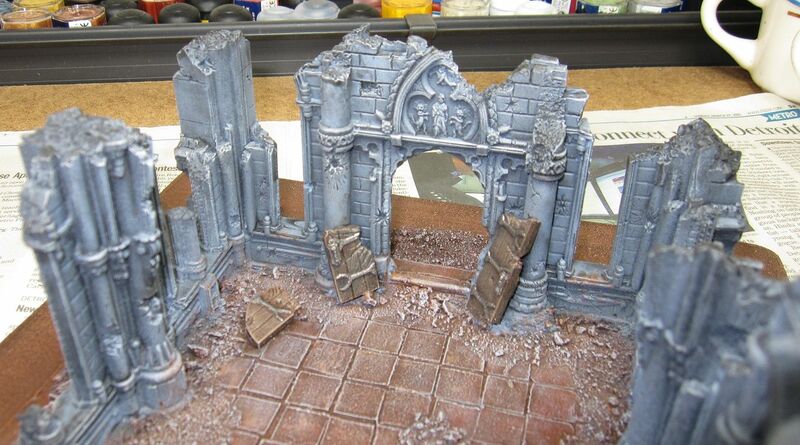 Stolen from the Ogre Stronghold. I like what I am reading, but take it for what its worth. 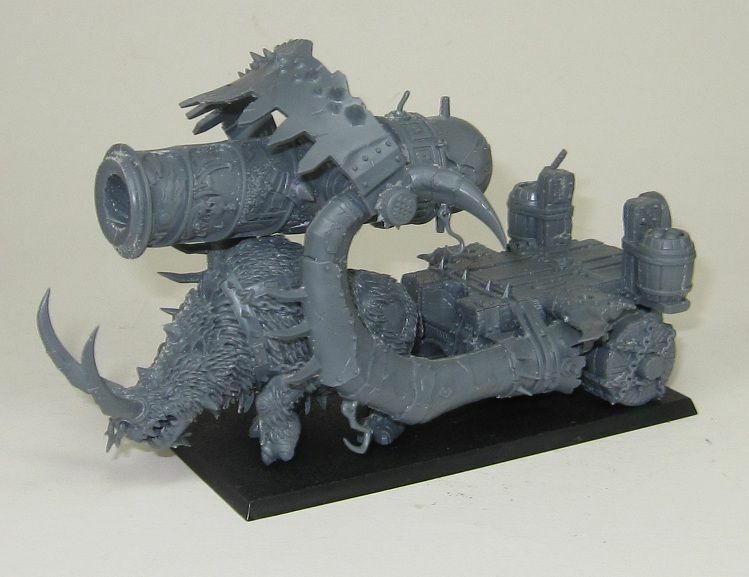 I am likely to believe the Plastic Rhinox Riders rumor given I just bought the Forge World ones, but I would be surprised if the plastic models can match the detail of the Forge World ones. 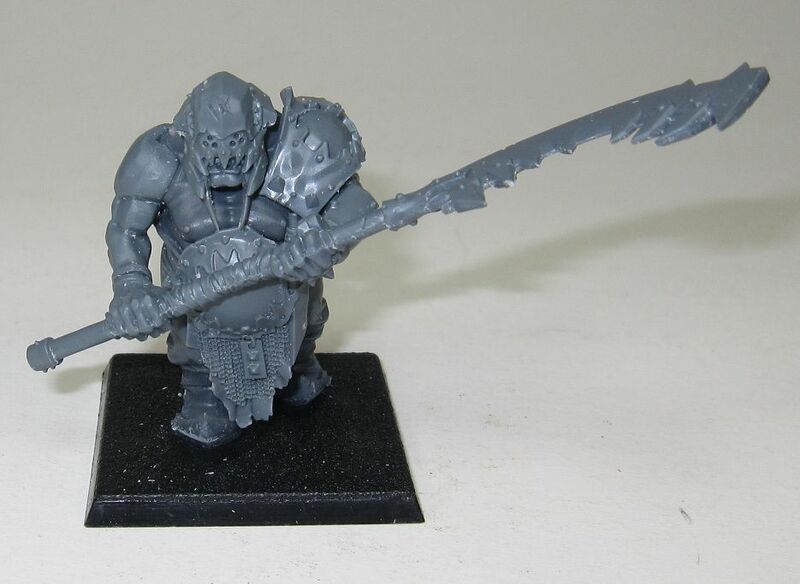 Litterally a small unit of Gnoblars can be made from the extras in these kits alone. 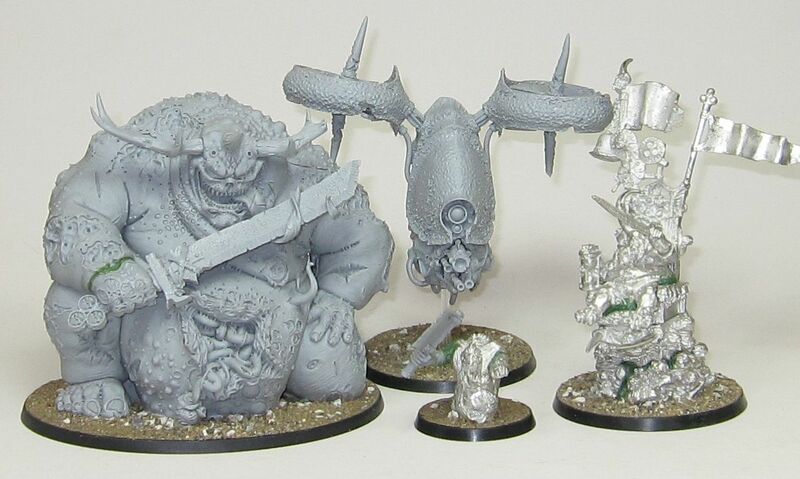 Old models redone in finecast: Goldtooth, Skrag, maneaters (box of 3, female, ninja and pirate discontinued), Tyrant/bruiser, gorger. 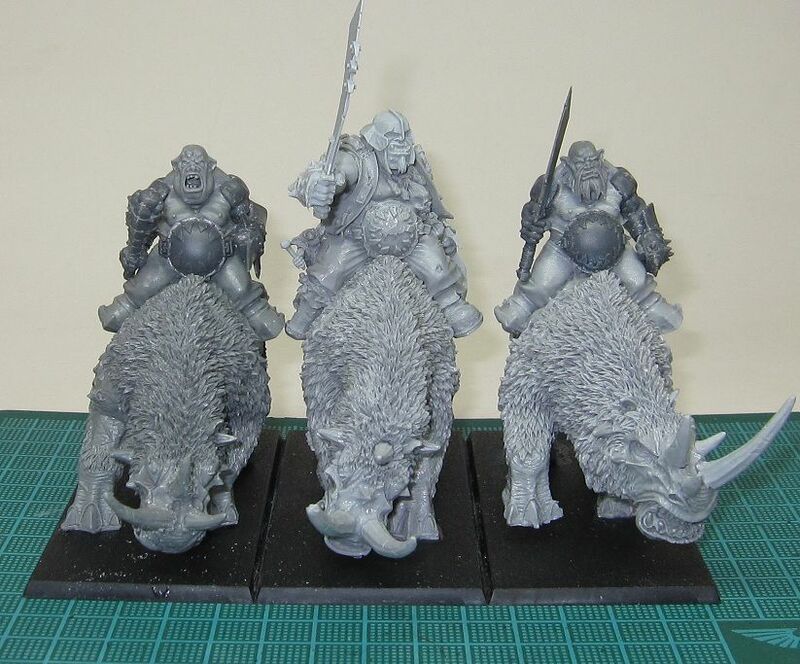 Bull Charge will work always, even though you're less than 3 ogres and charge less than 6". All ogres except butchers gain a basic 6+ save from their gut plates. Ogre Clubs negates parry save, and is a general rule for all weapons like Choppas in OnG. All army restrictions and max caps gone, but gnoblars do not count towards minimum core. Weapon options for units cheaper, and minor point reductions across the board. Bulls will stay same base cost. Magic will be standardized. Most spells will stay similar (augments with low casting values) but with greater range, and can be buffed to affect more units. 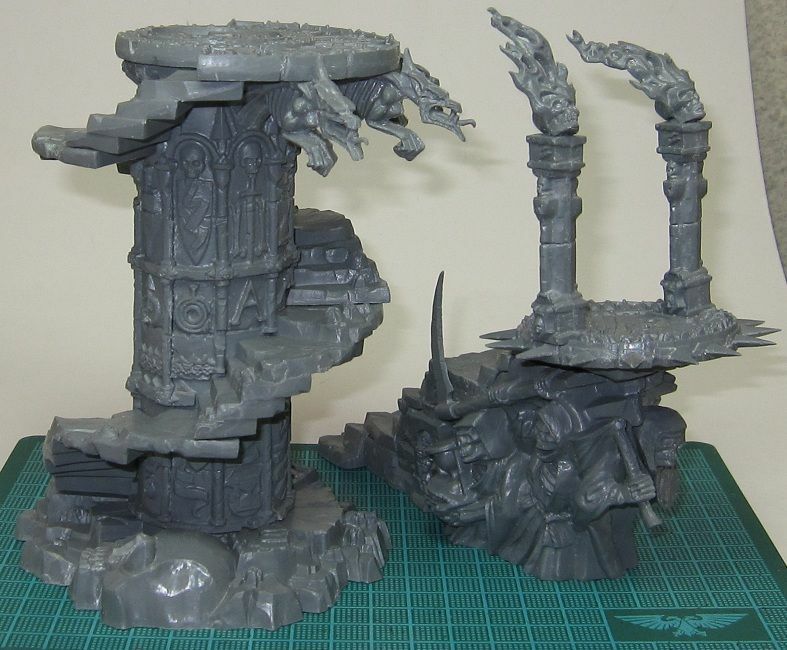 May also be cast on Yhetees and Gorgers. Rhinox Riders are super-hard. They get regular stomp and D3+1 Bull Charge, and also has Devastating Charge. (Special Choice). No mention of Bull Rhinoxen. Scraplauncher, same but moves to Rare, does D6+1 impact hits due to Rhinox's horns. 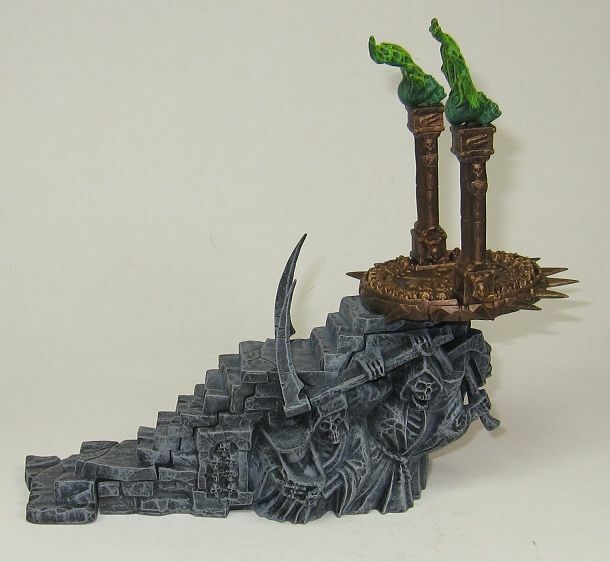 Rhinox and Mammox are mount options for Tyrant. Mammox can thunderstomp everything, like the SoM Bonegrinder Giant. Insane stats, but expensive (like 290 points base.). Crew can have leadbelcher swivel guns. Hunter greatly improved. Move and fire with harpoon and monster-killing special rules. Yhetees as in SoM, but with options for 2HW or GW. Leadbelchers auto-hit, and can fire every turn, but only S4, no AP. Don't come with Light Armour. Maneaters have massive point drop, and even more crazy weapon options. Can take a Special Character champion (Golgfag). Lots of new special character. one with an insane magic weapon. Greasus now LD10 and completely rewritten (Stats, rules and items similar to Gorbad Ironclaw). Half of items are Magic Weapons. Tenderizer and Siegebreaker will stay. There's a banner granting the same frenzy Minotaurs have. Plastics will be out in October. Finecast in November. This is Laddie. 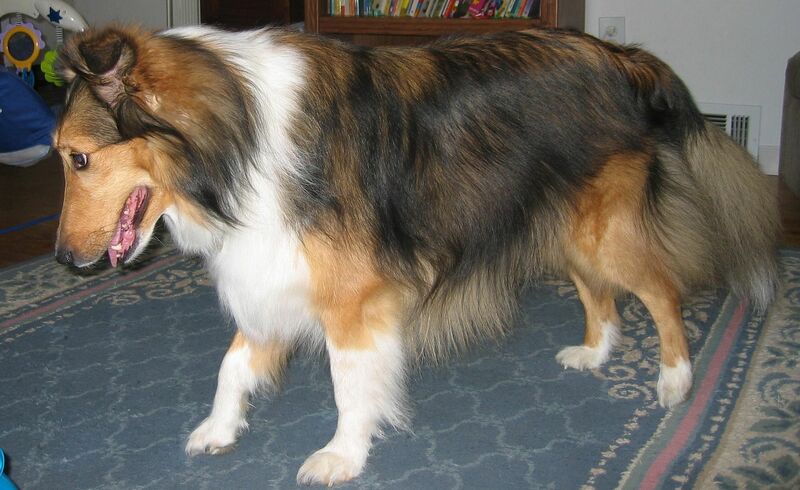 He is a sheltie and one of our family dogs. 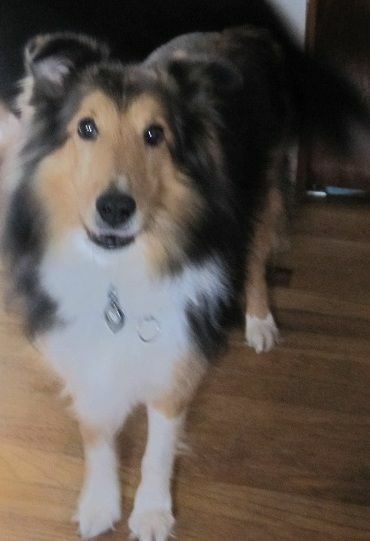 My Wife and I got Laddie from the Michigan Sheltie Rescue. 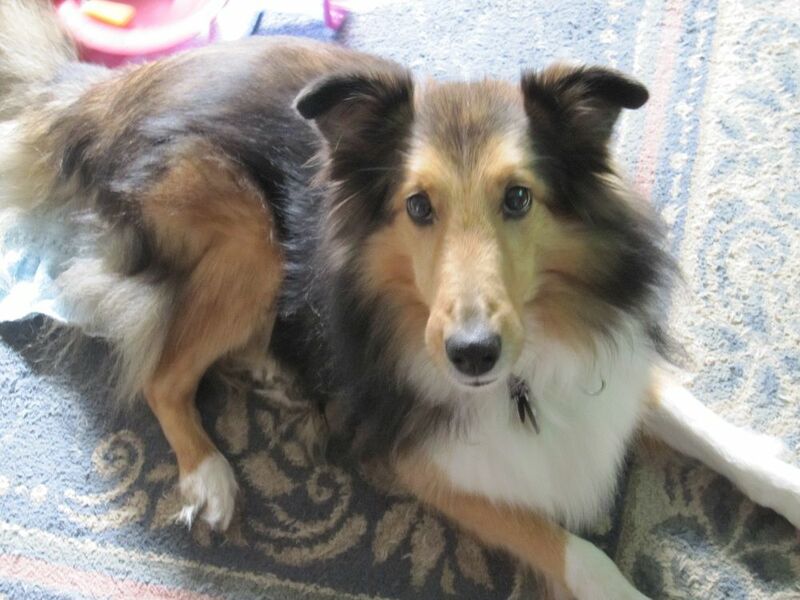 At the time we were looking to adopt there were three shelties available. Laddie won us over almost single handedly. Not only was he well trained, but what really got us was his overwhelming desire to play. He was three years old at the time. We had been told that he was given to the rescue shelter because his previous family was unable to keep him. Laddie was the name he came with and it seemed to fit him, so we left it. After buying our first home, the first night that we spent there was also the same night that we adopted Laddie and brought him home. That was July 3rd, 2001. I remember it clearly because Laddie spent the whole night hiding under the bed due to all the fireworks going off in our neighborhood. Shelties do not like loud noises like fireworks and thunder. It turned out that Laddie was very well trained as we came to find out years later. One morning when trying to get him to do a trick for a piece of breakfast sausage, Laddie out of the blue just rolled over on his own like he had been doing that trick forever. My wife and I were shocked at this because we had no idea. So we gave Laddie the command to roll over and he did. I think he regretted giving up the fact he knew this trick, because every roll over request since has been followed with this annoyed 'chuff' sound that seemed like he was upset to have to do this demeaning trick to get the treat. As if that was not enough, a few months later when trying to see if he knew how to jump through a hula hoop and sure enough he did. This trick was also accompanied with an annoyed 'chuff' with each request. We never found any other tricks that he knew, or that he would admit he knew. Honestly, I think he was hiding some. Laddie had one of the largest and strongest personalities of any dog I have known, and a bit of an attitude as you can see. 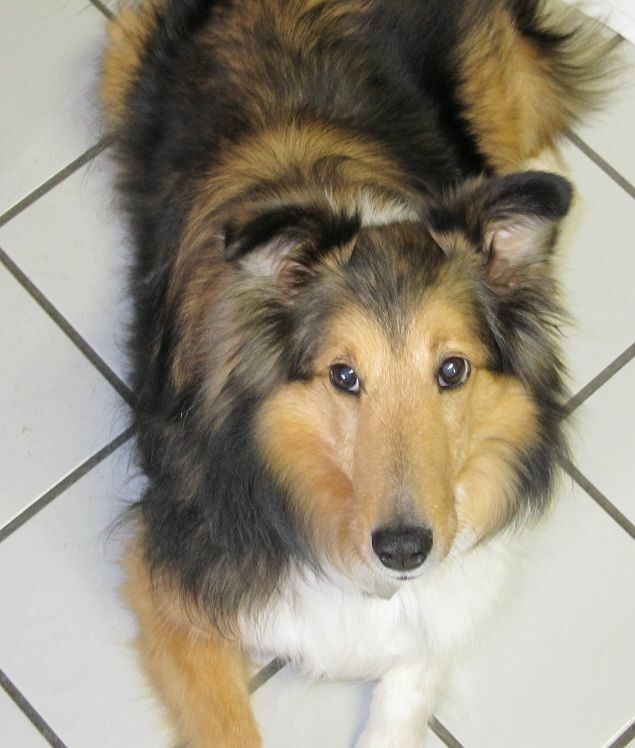 However, the largest thing about Laddie's personality was his desire for play, especially playing fetch. This dog loved more than anything to chase a ball and would do it for as long as you were willing to throw it. If multiple people were around, Laddie would always make sure that everyone got a turn to throw the ball and participate in the fun. He was oddly meticulous in this. Our guests would often end up with a ball dropped in their lap and a Laddie looking at them with this look that said 'You know you want to throw that for me!' If that did not work, he would be more than willing to show you how he could chase his tail and catch it, over and over and over again. Chasing the ceiling fan was his favorite solo sport. One thing about Laddie was that he did not care for children. We can only assume that the kids in his previous family mistreated him. 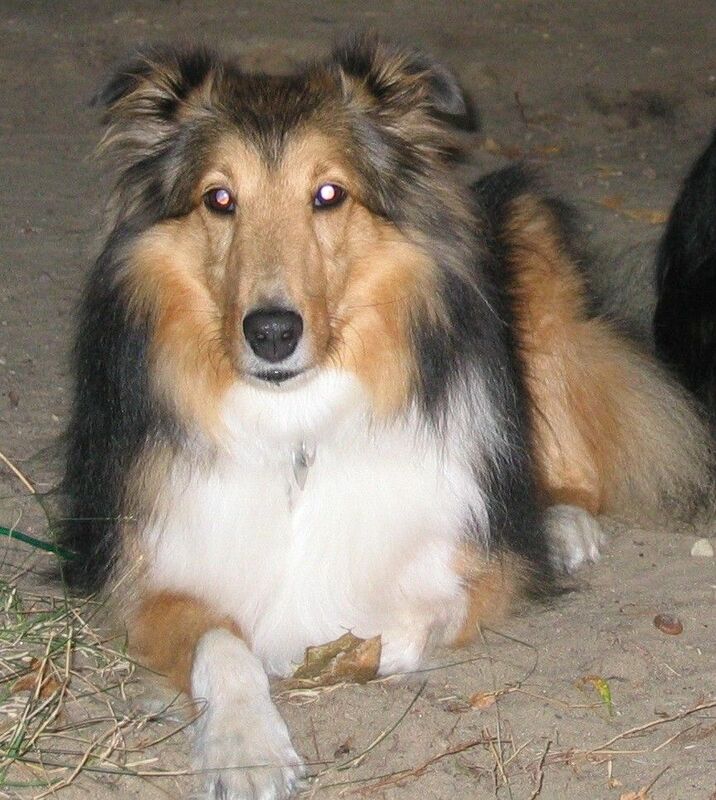 We had Laddie for four years before we had kids of our own. Laddie would always try to stay as far from them as he could, at least until they were old enough to throw a ball for him. 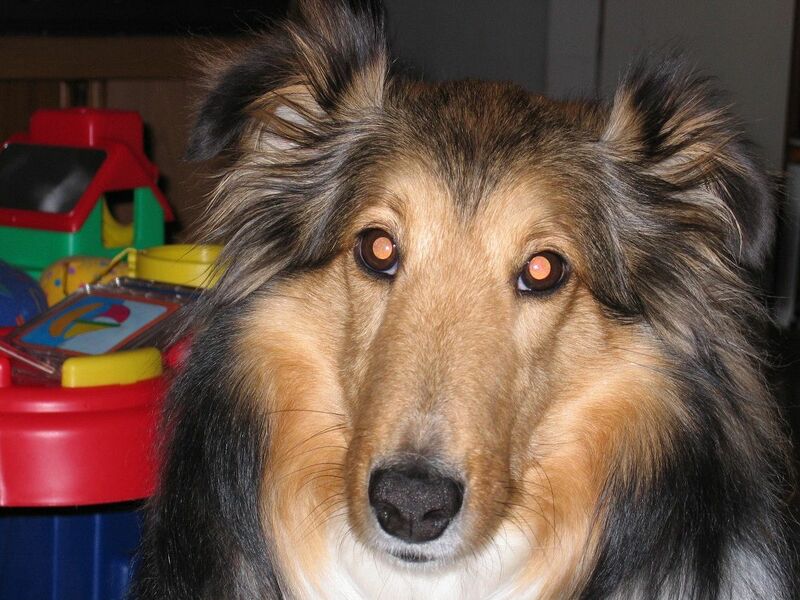 I worked with my kids to help them understand Laddie and his dislike of kids. They seemed to understand and there was a mutual respect that developed between them and Laddie. Anyway, this last Friday night, I was home watching the kids and my wife was out at a party with her friends. I had put the kids to bed and was in the basement painting my Ogres when I noticed Laddie quietly standing by the door like he wanted to go out. Odd I thought, he usually lets me know he wants to go out. So I took him upstairs and let him out. He walked out into the back yard about ten feet from the door and just lay down. I went out to see if he was ok and he was just lying there quietly. He was alert, but his breathing was a bit labored. I could not see anything visibly wrong with him. I tried to get him to stand up or move, but he wouldn't. So I carried him inside and laid him on the floor of the living room. I had thought about rushing him to an emergency vet, but given his age and health issues, it did not seem like it would help. He was thirteen years old and he had Bladder Stones, Hip Dysplasia and arthritis in his hips, but he never let any of this slow him down, right up until this day. I guess part of me knew that he was dying given his behavior. I though it best to keep him at home with his family and let nature run its course. I stayed with Laddie until my wife got home about twenty minutes later. By then Laddie's breathing had become more labored and he was not very alert. About ten minutes later, he took his last breath and he was gone. 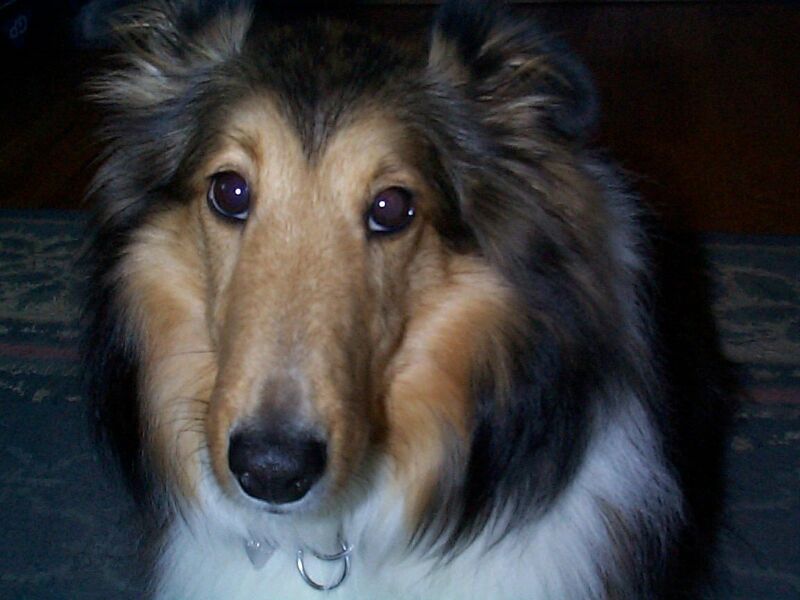 Laddie was my friend and my companion. He was always there when I came home from work, happy to see me no matter how bad my day was. He brought a lot of joy into my life. Since his passing, there is this hole in my life and the house feels oddly empty. I miss how he would always follow me around the house wanting to be where ever I was. This is not the first dog I have lost, but somehow it seems like the biggest loss of any of them. My wife and kids were hit pretty hard by this too. Goodbye Laddie, my friend. I miss you. Ok, I missed my 200th post. I have been so busy with real life for the past few months that I did not realize that I had passed it even though I knew it was coming up. I had wanted to do something special for it but so much for that. As I mentioned, I have been quite busy with real life for the past few months (work, family, summer activities, minor health issues, etc) and it has really been affecting my hobby life. I have not done much posting on my blog during this time. The last 40K game I played was on March 4th and I have not played WHFB since last year. My local gaming group has run two events in this time that I wanted to participate in but I dropped out of both of them because I knew I would not have the time or energy. The one thing I have managed to keep up with is my Painting Challenges, but I have not done much beyond that. Anyway, it looks like things are looking up and I will be able to get back to actually playing some games. In addition, all my hard work these past few months at work has payed off because I recently got a bonus. 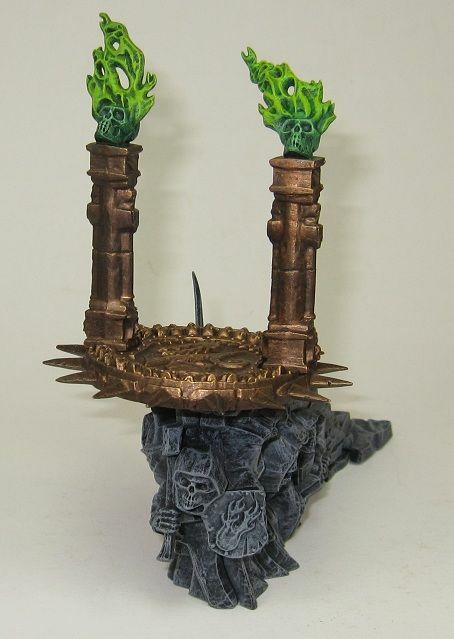 I have used this money on a Forge World order that will complete two of my armies. 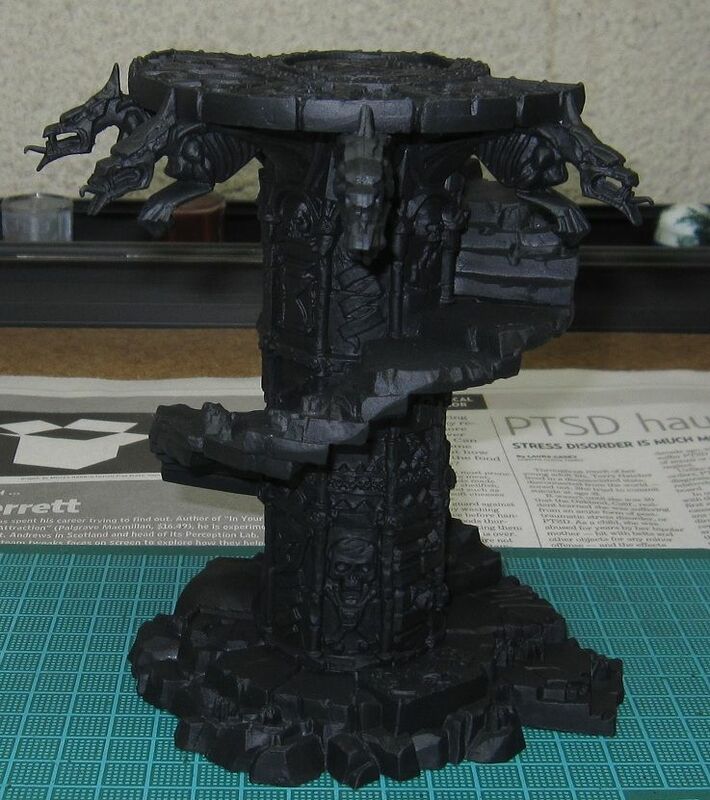 I am still waiting for the order to arrive, but it should be here within a couple of days. I am excited about this order and I will be posting the contents when the box arrives, which should be within a couple days. For my 40kFightClub 2011 Painting Challenge project this month, I am going to paint a unit of Ogre Kingdom Leadbelchers. 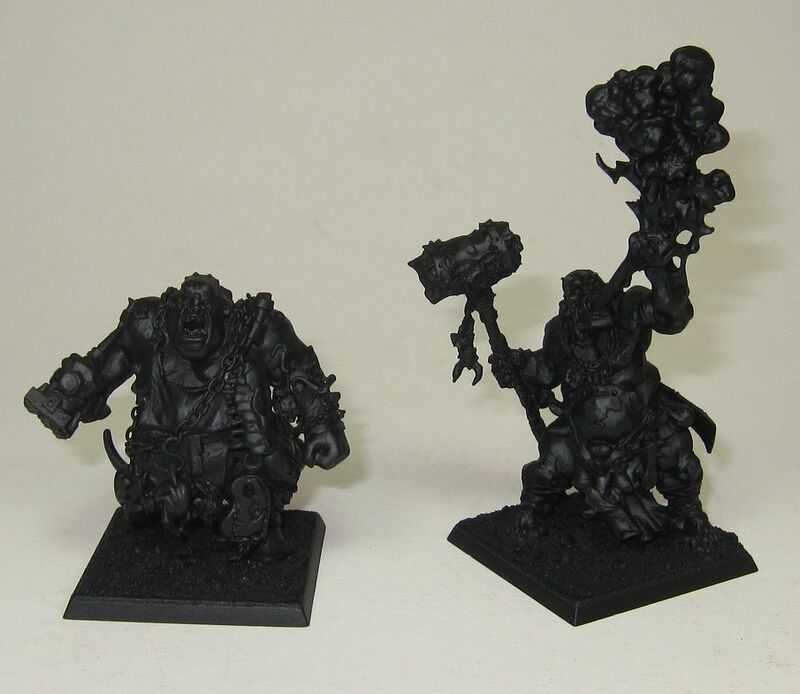 And for my personal 'Finish a Project' Challenge, I am going to finish a unit of Ogre Kingdom Ironguts. I have mostly completed my first Blood Angels Assault Squad. I still need to paint the Chapter and Squad badges, but I need more practice before I paint them on the models, but they are done enough to count for the 40kFightClub 2011 Painting Challenge.